- Additional Surcharge of USD 10 per pax Applicable For (SIC) Pick up Hotels at (Tanjung Rhu/Andaman/Four Season/Berjaya Langkawi/Lanai/Datai) to be paid during pick up. The tour start with the hotel/port pickup by our local driver to the jetty. 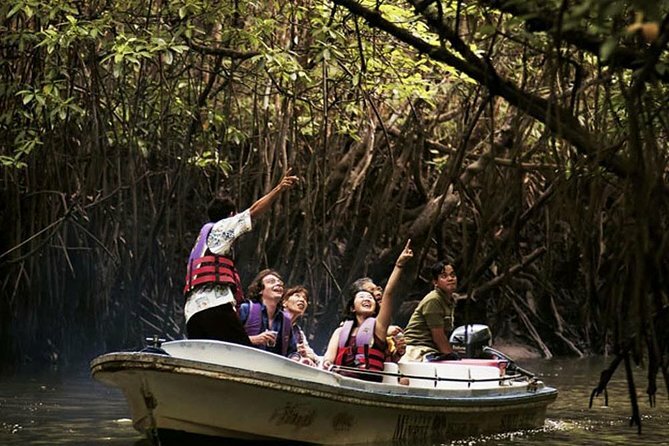 Travel by boat through the twists and turns of the Kilim river through the maze created by aerial roots and thick fleshy leaves of the mangrove trees. We often see mangrove animals that make their home in this delicately balanced ecosystem which is responsible for the health and wide variety of species in the Andaman Sea. We also explore how the mangrove area is a perfect environment for cottage industries such as fish farms. Our first stop is The boatman will stop the engine and throw some chicken pieces out into the water to invite the eagles. And in no time you will see eagles diving down just next to you and clawing up the chicken pieces and eating them as they soar into the sky. As we venture out of the mangroves you will see majestic limestone rock formations and sea stacks that rise dramatically from the ocean. This ancient coral thrust into the sky millions of years ago is home to a unique and ancient group of plants found no where else on earth. Then we are going to explore darkened bat caves and seeped in fabled tales of mysteries and romance. Visit floating modern fish farm and local fish farm is one of the tour.Our boat will drop you at the floating fish farm in a secluded cove surrounded by high vertical limestone and granite cliffs. You will have a wild time hand-feeding the rays. There are also a number of sea creatures kept in the 'tanks' but we shall not reveal too much - it's well worth the trip. Excellent guide - very knowledgeable and able to control the group. Only downside is that, the departure pick-up was too early 9am, arriving at pier 930am, whereas the actual tour only starts 1030am.